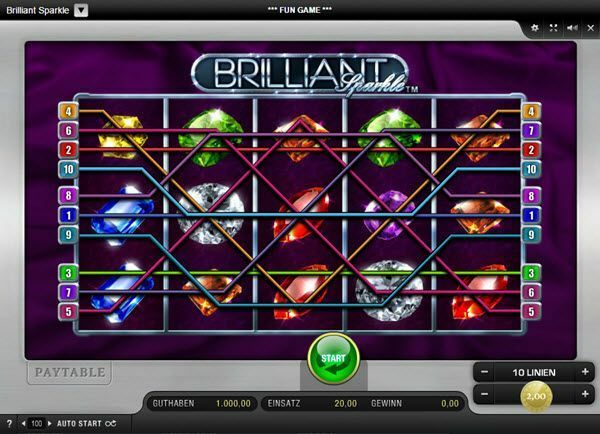 What is “Brilliant Sparkle” mobile slot about? Meet glittering dreams with diamonds, rubies and emeralds in the Edict Merkur slot Brilliant Sparkle. Lustrous, precious gems wherever you look, glamor and lots of chances to win. If you want to have a first look of all, as to how it works and see how much fun the game can bring, you can enjoy it in the comforts of your home without having to download an app, thanks to its compatibility in HTML5 for any Android or iPhone devices, and besides it works even free. You can do that without having to register and play in fun mode without betting real money. You start your game on five reels and a total of up to ten paylines that you can set flexibly. It is also possible to play with only three or five lines, for example. However, this not only reduces the round use, but also the number of possible combinations. Therefore, consider carefully how much risk you want to take while playing. Similarly, with your application too: this can be flexibly configured and you can start with just €0.01 per line or €2 per line. You can start each spin individually, or use the auto start button. There you can also set how often it should spin automatically. The player can deactivate this feature at any time. The exact profit plan is under the paytable button that you can always call and read in the game, and look upon the possible profit opportunities with combinations of lucky symbols. After use and profit lines are selected and you have started the game manually or automatically, you can catch the rattling rollers and the sparkling luck symbols move. At least three of the same motifs should appear on a line so that you can earn a profit. If you show the wild and multiplier symbols x2, x3 or x5, replace the missing icons and complete the winning line, then the amount of money or the use is multiplied with this exact monetary value. In order to win the jackpot of €2,000 you need to place 5 gemstones on a payline. With the help of the wild symbols this amount can increase to up to €10,000. The risk game is also available in Brilliant Sparkle. So you have the possibility of a gamble game between risk maps and risk manager to choose profit after each line. If you can guess the colour of the card turned face down, or click the correct button in the risk moment, then you win. But you have to take chances, because you can just as well after each line win collect your profits on your account and easily cash out.